Tear through the swamps of Louisiana and hunt the biggest and baddest gators around. Simulating the life depicted on the hit History™ show Swamp People, set-up camp in the deepest reaches of the swamp and prepare yourself to hunt and race through the bayous. 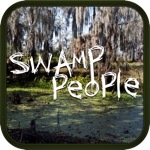 Learn the ways of swamp, survive deadly encounters with its residents, and show your friends you’re the best swamper on the leaderboard. This game has a 4.0 star rating (7731 ratings). It occupies the 78707th position in our ranking with 68 points. It is among the 5% best ones of its category and among the 5% best ones of the overall top.